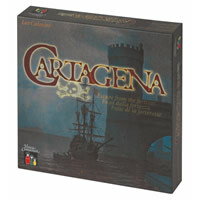 Cartagena is the great game of escape. In 1672 there was a jailbreak led by several pirates from the strong hold of cartagena. Now you get to relive that great jailbreak and do your best to escape without being recaptured. Cartagena will have you and your opponents racing to get out of jail. Test your luck with Cartagena and play this board game today with your friends and family! See the Cartagena game rules and instructions. Please keep in mind that the official Cartagena board game rules and instructions could be different depending on the game version you have. The rules below are some of the exact directions on how to play Cartagena. Share with us your comments, funny stories, tips, advice, strategies, creative ways to play, questions about how to play, problems with the rules or anything you want about Cartagena. All submissions will be reviewed within 24 hours. Click here to add your Cartagena comments.